It seems like there are only two types of people in this world. There are Apple people, and then there are Android people – two groups with little common ground in between. Little common ground, that was, until today: Introducing Google Now, an app that brings the quintessential Google Android experience to your Apple device. Google Now aims to be the only app you ever use on your phone. You can use it to check your mail, make phone calls, check the weather, or post an update to Google+. It’s like a new operating system for your phone that you can call up directly by tapping an iOS icon. The first time you use the app, you’ll be asked to sign in to your Google account. Once done, Google Now will start learning from your use of it, automatically providing you the type of local, time-sensitive information you use the most. For example, my own Now start page shares display cards telling me it’s 77 degrees out (what the heck am I writing this inside for?) and offers lunch recommendations that include a nearby Indian restaurant. The app also provides constantly updated traffic information for your commute home, relevant sports scores, and reminders about upcoming flights. It may be unsettling how much information Google has on you, but at least Now puts that knowledge to good use. And you can always limit how much information Google stores by adjusting your privacy settings. Google Now also consolidates seventeen other Google experiences under one supercharged app. 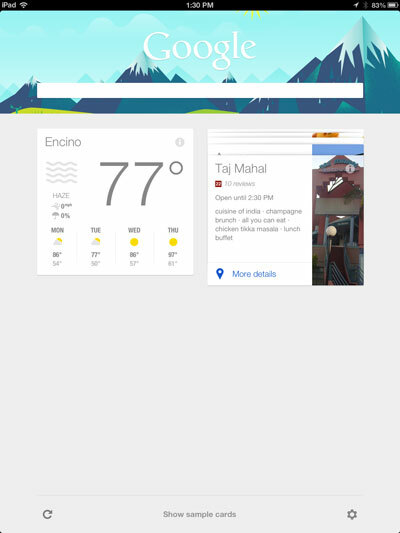 Tapping Apps on the lower right hand corner of the Now screen brings up a selection of many familiar Google features including Gmail, Translate, and Drive. Google Now wants it to be very clear to you that you have an entire smartphone experience inside the app – you never really have to leave it. And that’s by design. If you like the Now experience, you’ll probably like the Android phone experience. It’s a gateway drug of sorts – one the company is hoping will lure you away from your iPhone the next time your cell contract is up. Considering that Now is useful, elegant, and free, there’s no reason why every iPhone and iPad owner shouldn’t download it and give it a try. If nothing else, you’re expanding your technological horizons to see how the other half live, if only for a few searches. Google Now is available for download in the iTunes App Store for free.